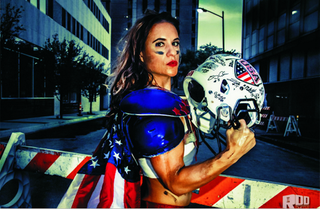 Jennifer Welter is apparently the first female running back to play in a men's professional football game, and her first rushing attempts came with contact. Welter—who has experience playing linebacker for the Dallas Diamonds of the Women's Football Alliance—hasn't made the final roster the Texas Revolution, an indoor football club, but she had a few touches Saturday against the North Texas Crunch, and goddamn, she got hit. Welter's only five-foot-two and 130 lb., so every tackle seemed to make the crowd tense as she ran at men much larger than her. She was totally fine, though. "I said 'Is that all you got?'" Welter told 6-4, 245-pound Crunch defensive lineman Cedric Hearvey. "I didn't want them to think I was intimidated." Welter's attempts all came in the red zone, but she wasn't able to score a touchdown, finishing the game with three carries for -1 yards.